Critical in any studio, most low-frequency microphones cost anywhere from $100 to $500. The ones on the lower end of the price scale don’t deliver fabulous quality; they allow a good deal of bleed from treble instruments while providing bass response only slightly better than a standard vocal mic would. Fortunately, using a few spare parts, you can build one that rivals the expensive models. This is one of the easiest studio hacks, suitable for beginners with no electronics experience, and the results are truly surprising. Better yet, you’ll save hundreds of dollars while upcycling stuff you weren’t using. The only tools needed are a power drill-driver and something to strip wires (a lineman’s plier or most pocket multitools will do it). Here’s the recipe. Most speakers can be reverse engineered into DIY mics. The most useful are the woofers (bass speakers) from three-way speaker towers. Modern speakers tend to be smaller, so these big towers are frequently sold cheaply at tag sales or put out by the street for free. You may well already have some you’re not using. 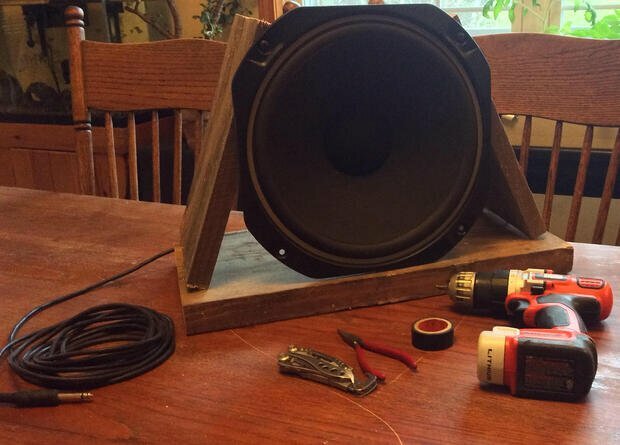 Aim for a large woofer; 12 inches or so is good.Remove the speaker grill, if it has one, and unscrew the four screws that hold the woofer in the cabinet. Once you have the cone of the speaker out, you’ll see two wires, most likely red and black, attached to the cone. Cut these wires where they attach to the interior of the speaker box, leaving as much slack attached to the cone as possible. Now, strip about a half an inch of plastic insulation off the cut ends of the wires, being careful not to cut the metal threads inside. You now have the giant diaphragm of your low-frequency microphone. Don’t throw away the screws you just took out; you’ll need them later. Remove the speaker grill, if it has one, and unscrew the four screws that hold the woofer in the cabinet. Once you have the cone of the speaker out, you’ll see two wires, most likely red and black, attached to the cone. Cut these wires where they attach to the interior of the speaker box, leaving as much slack attached to the cone as possible. Now, strip about a half an inch of plastic insulation off the cut ends of the wires, being careful not to cut the metal threads inside. You now have the giant diaphragm of your low-frequency microphone. Don’t throw away the screws you just took out; you’ll need them later. Remove the screw from the female end of a microphone cable. The metal housing slides off, revealing three soldered terminals. Of the wires attached to these terminals, one wire will typically be white and another black (the grey one is a ground wire, which we won’t need). Using your pliers, carefully remove the wires from the terminals. As before, strip a little insulation from the black and white wires. Now you’re ready to join the wires. Twist the black wire from the speaker to the black wire on the cable. Then join the red speaker wire to the white wire from the cable. Once they’re twisted together, you’ll want to screw a plastic wire nut onto the joined wires to keep them together and prevent them from grounding out on any other metal. If you don’t have any wire nuts handy, just wrap the joints in a very short length of electrical tape. Before doing any more work, plug your mic into a phantom-powered mixing board and test it. Try holding it up in front of a bass drum, bass guitar, or any instrument with a lot of low end. If you’re getting a good signal with no buzz or static, you’ve done the first two steps correctly. Now seal up those wire connections with more tape so they’re secure. It’s time to finish the job. Obviously, you can’t keep holding your new mic up in front of sound sources. Find some scrap wood and use the speaker’s mounting screws to construct a simple frame that allows the mic to stand up. It doesn’t need to be pretty, but it does need to be secure and strong. You can get creative with this step and use whatever might work. When working, be extremely careful not to puncture the cone of the speaker with your tools! Screw it together firmly, using more hardware than you think you’ll need. It always pays to overbuild. If a bandmate can sit or step on this structure without breaking it, you’ve done your job. As an alternative, if you’re skilled with a circular saw, you can just cut off the portion of the original speaker cabinet that had your woofer mounted in it originally, drilling a hole in the box for the microphone cable to pass through. Besides being cheap and easily constructed, this mic has three very serious advantages over store-bought mics. First, the huge diameter of the diaphragm admits tons of low-frequency response. Second, this mic "hears" almost no treble, so even on a drum set there will be a ridiculously small amount of bleed from the snare and cymbals. Lastly, the mic’s natural input gain is low. It takes a lot of air pressure to move that big diaphragm, so you can place it half an inch from a thundering bass drum or speaker cabinet without clipping. The one downside? The speaker cone is fragile, so it’s a good idea to store it somewhere up high or in a cabinet when it’s not being used. It would be a shame to have someone kick the cone by mistake and destroy your hard work.